Were You Lucky Enough To Meet Chilly? 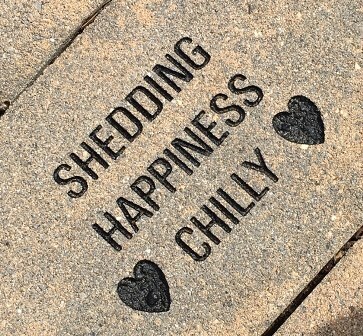 Any one who was lucky enough to meet our Chilly knows…he truly did Shed Happiness♥ Our great friends at Fetch A Cure have honored Chilly with a paver stone. The stone is located outside of their headquarters here in Richmond at 5711 Staples Mill Road, Suite 101, VA 23228. He joins the ranks of other beloved pets lost to cancer♥. The pavers lead you to their healing garden♥. What Is Fetch A Cure? Fetch A Cure is a non-profit organization started in 2006. 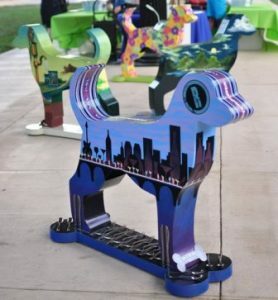 Their mission is “to raise awareness, to educate and provide pet owners greater access to information about pet cancer, senior care and treatment options.” Anyone who lives in, or has visited the Richmond area will recognize the Fetch A Cure steel dogs , (and now cats) around town. We have two in the entry way to Helping Hands! The purpose of the steel sculptures is to raise awareness about pet cancer and encourage pet owners to look for early warning signs in their pets. Chilly was an Ambassador of Love and Quiet Strength. My prayers and thoughts are with ALL of Chilly’s family! My Dad & I met Chilly when we brought my Izzie there for dental work. Such a sweet furbaby! Rest in Peace!! Sweet tribute for a sweet boy. Rest in paradise Chilly. Eff cancer.